Uechi-Ryu.com • View topic - Does your System cover everything? Don’t panic – it can't. Following Threat Assessment, the next level in the use of force continuum is to Seek Assistance. Once you have determined something is out of place, or out of norm through situational awareness, have determined that there is a threat and have removed any ambiguity in your assessment, you should immediately call for assistance. If you can remove yourself from the situation and fall back to avoidance, then you should do that, and hopefully you will have time to call police, or summons aid from others around you. If you cannot remove yourself from the situation, it is still a good idea to start help your way. Calling 911, even if you only have the opportunity to set the phone down and keep an open line, is advisable. You want to be sure that you at least announce your location, and to send help. At this point, it would also be advisable to make sure that the suspect knows that you have called the police and that there is an open line. This may be enough for you to avoid any further action, or to remove yourself from the situation. If you are forced to move to the ACTION level of the civilian use of force continuum, if possible, you should always start with de escalation, verbalization, and lastly physical contact. The goal of action is to first avoid a confrontation through de escalation and verbalization, and to lastly have to physically defend yourself. Again, any action should attempt to fall back on avoidance. 1.De Escalation: De escalation can be achieved by various forms of action. You physically removing yourself from the situation is an action and a form of de escalation. Locking yourself in a car may be enough to give the suspect a chance to calm down, or lose interest. Verbalization is another form of de escalation. 2.Verbalization: Communication is key to de escalate a potentially volatile situation. and should display patience, understanding, and professionalism. Listening is also very important when trying to calm down a suspect or situation. 3.Physical Action: If de escalation and verbalization does not stop the suspects actions toward you, and they reach a point to where you feel you are in danger of great bodily harm or death, then you are left with no other choice to defend yourself physically. •Physical attributes- height, weight, strength, etc. •Physical limitations- disabilities, injuries, medical history, etc. An example of this might be of a 25 year old, athletic, 6’4” male, weighing 210 pounds physically assaulting a 76 year old male, weighing 140 pounds who is on heart medication and blood thinners. One blow to the victim in this case could be deadly, so if the victim pulled a firearm in this case, it could be seen as lawful. If the suspect continued to advance on the victim, and the victim perceived that his life was in danger, deadly force could be seen as lawful, even though the suspect is unarmed. This is not to say that if the tables were turned in this example that it wouldn't be lawful, but these are all things that will be taken into account during the investigation. As far as training goes, in a civilian self defense use of force, training will be looked at after an event, but it doesn't mean that someone who has training in self defense cannot use physical force, or even deadly force against someone who is much bigger, stronger, or younger than them if the force used is reasonable. Perception and reasonableness of the response will also be looked at from an investigative standpoint. How the attack or threat was perceived to the victim at the time. If there is a legitimate threat, meaning the victim did not start the incident, or put themselves into the incident, and is it possible for the suspect to carry out the threat? If it was possible to carry out the attack, or if the suspect did attack, was the response from the victim reasonable? Sometimes this is all valid, but the force used continues into a point where it is unreasonable. An example of this has been seen in several cases across the country in recent events, where there was an attack, or a valid threat, and the victim responded with a firearm, but the suspect flees the scene on foot or in a vehicle and the victim continues to shoot as they are fleeing. If the victim is fleeing, then the threat is no longer valid threat, and any force used past that point is illegal. These very people who never sparred and never had the balls to sign up for an open tournament, yet they had some high Dan rank, would belittle the fighters and 'exclude' them at every opportunity...while in the mean time in their presence, they would perform a prearranged kumite and then look down their noses at you while strutting the floor. The strutters were always absent when those two national champions expected a challenge on the Mattson Academy floor. Rabesa would tell you some good stories about those people. Tommy san= a very smart man. And the most important thing to add to any physical system, is the tactical component based on violence dynamics...like we read in Rory's book "Facing violence"
Like when most Uechi people thought I was from a different world when I first introduced the 'chemical cocktail' adrenaline effects...that Maloney and me had learned from attending the Mas Ayoob/John Farnam "duelatron" scenarios with loaded .45 pistols in New Hampshire. This book stands alone as an introduction to the context of self-defense. There are seven elements that must be addressed to bring self-defense training to something approaching ‘complete.' Any training that dismisses any of these areas leaves you vulnerable. 1. Legal and ethical implications. A student learning self-defense must learn force law. Otherwise it is possible to train to go to prison. Side by side with the legal rules, every student must explore his or her own ethical limitations. Most do not really know where this ethical line lies within them. 2. Violence dynamics. Self-defense must teach how attacks happen. Students must be able to recognize an attack before it happens and know what kind they are facing. 3. Avoidance. Students need to learn and practice not fighting. Learning includes escape and evasion, verbal de-escalation, and also pure-not-be there avoidance. 4. Counter-ambush. If the student didn't see the precursors or couldn't successfully avoid the encounter he or she will need a handful of actions trained to reflex level for a sudden violent attack. 5. Breaking the freeze. Freezing is almost universal in a sudden attack. Students must learn to recognize a freeze and break out of one. 6. The fight itself. Most martial arts and self-defense instructors concentrate their time right here. What is taught just needs to be in line with how violence happens in the world. 7. The aftermath. There are potential legal, psychological, and medical effects of engaging in violence no matter how justified. Advanced preparation is critical. 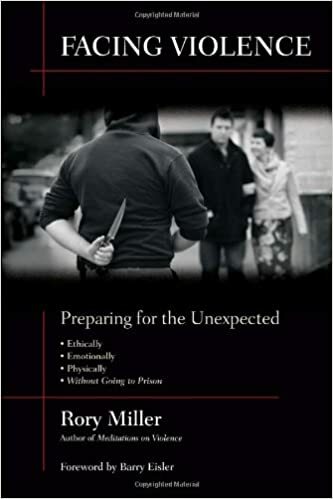 Any teacher or student of self-defense, anyone interested in self-defense, and any person who desires a deeper understanding of violence needs to read this book. This is the most important 'cross training' there is for Uechi students with an interest in self defense/self protection...especially for the teachers on the floor. But I know a great number of Uechi people, Paul, who don't think it is necessary because it is all built in the style. Same mistake as the black belt who ended up with his throat cut by the gangbanger. They should have been with me the morning after the killing in the small lobby with blood spatter all over the walls and ceiling, the stench of death and the horrible fear just dangling amongst the tenants. Violence dynamics. Self-defense must teach how attacks happen. Students must be able to recognize an attack before it happens and know what kind they are facing. This is the biggest failure of us teachers on the floor. Good of you to reinforce the critical aspects of potential engagements, Rick. And as you well know, despite the books/the training/the practice of such components...when a situation arises we still have to battle with our ego and do battle with the 'system's demon' that perches on your back demanding to be respected by you and by others simply because you brought it 'alive' by your floor training. So the 'High-Jack' arises within you...and pushes you to silence the demon that has invaded your good sense. form of kickboxing and the national sport of Thailand, in 1994.
appeared regularly on HBO and ESPN and headlined fights at the MGM Grand and the Mirage in Las Vegas. He was a dedicated competitor who trained tirelessly, often waking at dawn to run five miles and perform scores of sit-ups, push-ups and other exercises before going to work. also a Jeep Cherokee, was hit by a passing car. Enraged, Gong gave chase on foot, going a block east on Clementina, then a block and a half south on Fifth Street. At that point, Gong confronted the driver, who had been forced to stop as traffic backed up near the Bay Bridge on-ramp. who was riding in a car on Fifth Street. As in the killing by the gangbanger...here we see another example of how the demon inside the martial art you study, arises within the self so it can just kill you, or send you to jail for life. And how many of these 'tough guys'/any style, have you seen grace my forum over the years Rick? ...when a situation arises we still have to battle with our ego and do battle with the 'system's demon' that perches on your back demanding to be respected by you and by others simply because you brought it 'alive' by your floor training. A truism like no other_ to very wary of...even as you deny it. Here is an article that gets to the heart of the problem. EGO! Loosely defined it as an exaggerated opinion of one's self. This can be the martial artist's strength or downfall. All too often it is an unfortunate hindrance to our growth and development as we pursue our combat endeavors. As I sat home reviewing the fight in my head I was embarrassed and frustrated that this 18 year old had hurt me. Yes, I easily won and should have with my years of training (and his lack of training) but my ego was bruised. He only got a few strikes in but one was enough to affix a reality of his strength. At first thought I justified his successful strikes as a result of his six foot four and 270 pound frame against my five foot nine inch 165 body. Ahh, somehow the excuses began to emerge. He is young....I am an old 46. (Or maybe young 46....sometimes my body isn't so sure either way.) Perhaps that's it? I wondered and rationalized and ultimately searched for answers. There was still an uneasiness and troublesome thought. Eventually I egotistically justified his improvement as perhaps a benefit of my coaching. There's that self-aggrandizement again. Yet this was in fact true. It was also true however, that my student had hit me with a very good strike and he hurt me. I may have won the fight but a lesson was surely learned. Suddenly my ego found its place in my fragile mind. Ego can grow into a monster called the "Master" that no longer trains with his students. Ego can be like the snowball that becomes a mound of destruction as it rolls down the hill. Ego is a path that needs guidance and constant evaluation. Without insight and objectivity this is a path bound for failure and stunted growth. The martial arts are like any athletic pursuit; although we often somehow categorize martial arts into something entirely different. This is such a travesty and so wrong. How is it that martial arts have developed into more art than athletic pursuit? There is nothing wrong with art; indeed it has its place. However, the combative side of "martial arts" is based in athletic training principles and concepts. It requires proper training and lots of it on a regular basis. It requires an ever increasing level of difficulty and testing of one's mental and physical attributes. It requires a testing of the EGO! A world of perception is quite deceptive and dangerous for the martial artist. Many prominent instructors have preached this concept. From Bruce Lee and his first generation students like Richard Bustillo, Larry Hartsell, Dan Inosanto...... to the new breed such as Straight Blast Gym's Matt Thornton, Eric Paulsen, Burton Richardson and many of the mixed martial artists of today. All these individuals have recognized the benefits of reality based training. Tony Blauer has expanded this concept to both psychological and physical training. Many of the military combative instructors fully recognize the need for reality training and constantly strip the participant of all ego limiting thoughts. This is necessary to accurately analyze and research effective technique. More importantly, it is an absolute in developing and mastering technique......technique under duress, chaos and with an opponent full of bad intention. The common similarity with all of these individuals and their training methods is that the ego is constantly being tested. Reality can do that. Perception does not. Of ten it is easy to progress in the world of rank and glory and we slowly have a greater perception (or misconception) of our ability than reality would demonstrate. The best teacher is a good student and the best student recognizes that learning is a constant growth process. If our ego is not kept in check than that growth process dies along with our ability. Somehow it becomes easy to justify our lack of technique or inabilities because our perception is distorted by the negative protection our own egos. My students were very respectful of the instructor's opinions, but they also recognized the limitation of his thought and his suggested technique. The instructor graciously demonstrated his method of defending against an oncoming opponent. In a slow, non-intentional manner it worked. However, in a reality and no-limit environment where chaos rules, he immediately found his thinking and technique flawed and impossible to effectively initiate.